Cycladic frescoes and painting pictures collection Each thumbnail photo is a link to a larger version of the same photograph. Cylinder with painted representation of fishermen moving. Phylakopi III on Melos Beginning of 16 th .cent.BC. Frescoes from a buiding with a pillar crypt. Phylakopi III on Melos. Beginning of 16th cent. BC. Frescoes from a bulding with a pillar crypt. Phylakopi III on Melos. Beginning of 16th. cent. BC. National Archaeological Museum of Athens. Thera, Akrotiri. 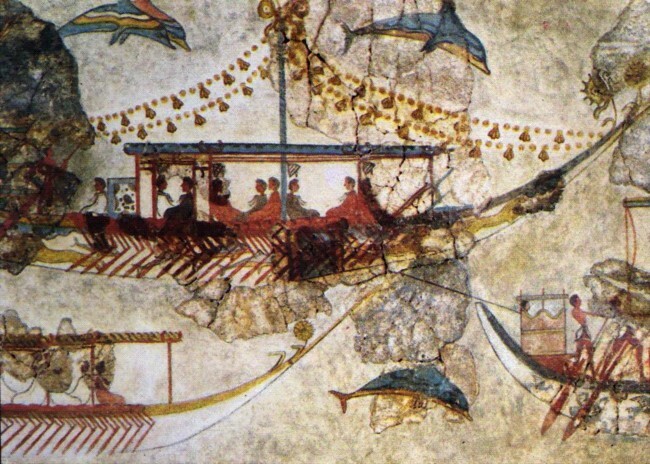 Part of fresco with ships. Museum of Prehistoric Thera. Thera, Akrotiri-Sector Beta. 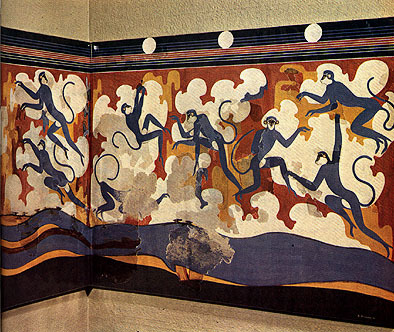 Part of fresco with blue monkeys (room Β6). Museum of Prehistoric Thera. Thera, Akrotiri-Xeste 3. 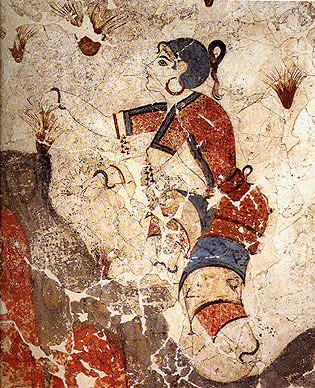 Detail from the fresco of the Saffron Gatherers. Museum of Prehistoric Thera. Thera, Akrotiti.A fisherman. Museum of Prehistoric Thera. Thera, Akrotiri. The boxing children. Room B1 Building B. Museum of Prehistoric Thera. Thera, Akrotiri. The Antelopes fresco. Room B1 Building B. Museum of Prehistoric Thera. Frescoes from a buiding with a pillar crypt. Phylakopi III on Melos Beginning of 16 th .cent.BC. National Archaeological Museum of Athens.